Fredericksburg, VA---Fredericksburg Baseball will hold a groundbreaking ceremony for the organization's state-of-the-art new stadium on Sunday, February 24th, from 2:00pm-5:00pm. Team owners Art Silber, Lani Weiss, and Seth Silber stated: "We are excited to take this next step towards opening our ballpark in April 2020. This is a great opportunity to share our excitement and plans for the new stadium with the community, and recognize the incredible support from the City, fans, and sponsors who have turned this dream into a reality." RSVP's are not required, but are appreciated. 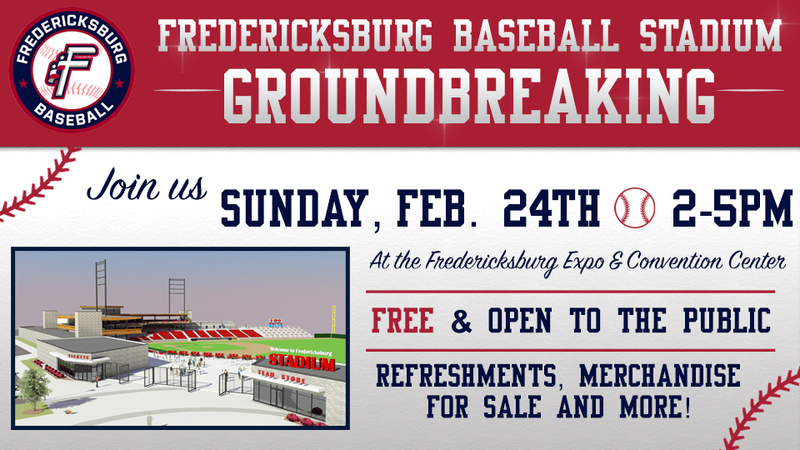 To RSVP for the groundbreaking event, or for more information on the event, the Founders Club, or Fredericksburg Baseball, visit FredericksburgBaseball.com. Fredericksburg Baseball is set to begin Carolina League play in 2020 at a brand new, state-of-the-art stadium facility, located at Celebrate Virginia South on Carl D. Silver Parkway near the Fredericksburg Expo & Convention Center in Fredericksburg, VA. Celebrate baseball in The 'Burg and stay up to date with the progress of the new ballpark facility and the team online at Fredericksburgbaseball.com, and follow Fredericksburg Baseball on Facebook (@FredericksburgBaseball), on Twitter (@FXBGBaseball20), and on Instagram (@FredericksburgBaseball).